Not every job in sports requires you to have a 40-inch vertical leap or to run a sub-4.4 40-yard dash. There are plenty of support positions within the professional, collegiate, and amateur sports industries that need people with skill sets just like yours. These jobs offer exciting opportunities to be on the inside of one of the most popular professional sectors on Earth. As such, the competition for them can be extremely high. While your knowledge and previous experience are no doubt impressive, they may not be enough on their own to get you noticed in a crowded candidate pool. If you have well-written resume supporting them, however, you have what you need to draw in the attention of general managers, athletic directors, or anyone else you are trying to impress. Shown here are several sport resume templates that will help you create the ideal employment reference document. Why Use Sport Resume Templates? Information shared by the U.S. Bureau of Labor Statistics shows the projected job growth of positions within the sports industry to be as fast as (or even faster than) that of other careers. Yet those projections can be misleading. The number of jobs available within sports is often much less than you see in other industries. That is why it is essential that you have the right resume (written using the right format) to help you in your job search. More than that, they help ensure that you utilize just the right amount of content needed in order to get your point across. The biggest problem that both first-time and seasoned resume writers encounter is deciding what information to include. Recruiters typically have less than a minute to review a resume, so keeping yours to one page ensures your audience gets all of the information you want it to. The one-page sport resume templates shown here will help you keep your document brief by only including your most important information. If you are having trouble deciding upon the best resume format to use, you may want to stick with a traditional classic style. These templates utilize tried-and-true methods that have proven to transcend both industries and trends. They help keep a reader’s attention focused on your resume’s informational elements by incorporating the right balance of font type, header size, and available whitespace. Matching the right resume format to the type of job you are seeking is important. If this is your first attempt to get into the sports industry, then you may want to follow simple entry-level sport resume templates when creating yours. These prompt you to enter only straightforward and relevant content in a manner that allows your audience to quickly gain an understanding of the talents you possess. 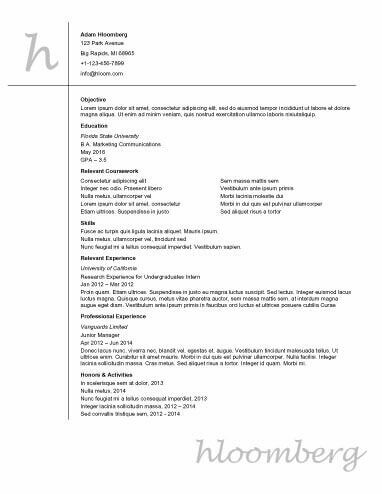 Similar to an entry-level resume, a functional resume works when you do not have a lot of experience in the field you are looking to get into. Such a template will focus on emphasizing how your education and skill set qualify you for the position. While there is some space reserved to detail your work history, the point here is to prove your capability of succeeding in a job. If you are looking to present your previous experience combined with your relevant skills in a way that really impresses sports franchises and organizations, then professional sport resume templates are the resources you will want to utilize. These amplify your skill set by presenting it in a modern, sleek-looking format that shows your technical skills as well as the effort you place on making a good first impression. You may have noticed while reviewing the many different sport resume templates provided here that even though their formats differ, the content they ask for is typically the same (or, at the very least, similar). Yet do not make the mistake of thinking that your resume’s content is any less important than its format. The best-looking resume in the world will only hold a team president or administrator’s attention for so long; it is up to your content to justify any initial interest. Only include information such as your cumulative GPA or courses studied if you can do so while still keeping this section brief. Our resume builder will help you match the ideal resume style to your particular job pursuit to help you create a document certain to have influence over those who read it.